3M™ Antistatic Utility Tape 40PR Printed 3M 40PR | Fabrico, A Division of EIS, Inc.
General-use utility tape, 1-mil clear polyester film backing, anti-static conductive polymer adhesive. With preprinted static symbol. These tapes have a multitude of uses in component design and manufacturing as well as to support the insulation of components. 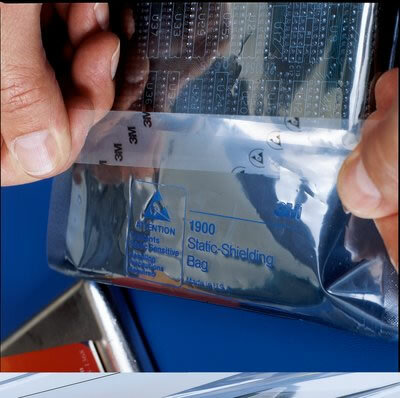 The tape is supplied on a paper core; antistatic plastic cores are available to minimize particulate contamination in clean work areas. 3M 40 printed antistatic utility tape can be used at static-safeguard workstations as part of your total static control program. It generates very low levels of static charge even in dry conditions of 10% relative humidity (RH).